When Andrew Kearns first started taking pictures, people told him it was almost impossible to make a living as a photographer. They thought he needed a “safe” career. They were wrong. In early 2015, he took a leap of faith and left his job at Starbucks. His Instagram took off, and soon after that, his dream became a reality. Since then, he’s taken more risks. In the spring of 2016, he left everything behind to live out of his car and explore the world around him. These days, Kearns is still traveling, shooting sublime landscapes and chronicling his adventures on his popular vlog channel. He’s watched the sun rise and set over some of the most beautiful places on earth, and most recently, he’s hiked Ben Hope in Northern Scotland. We interviewed Kearns about Instagram stardom, the importance of hard work, and the value of a Squarespace website. You have an enormous Instagram following. Has the platform guided your aesthetic at all? You have taken some big risks for your creative career, like quitting your job. Have they paid off? Tell us about living out of your car. Did you face any challenges? Does being a hiker enable you to see landscapes that are inaccessible to most people? How do you define success as a photographer? Why is vlogging such an important part of your practice? 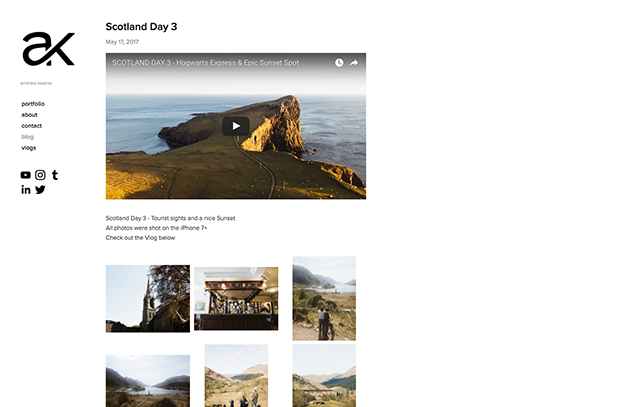 Why did you use Squarespace to build your site? What template do you use? Is updating your site convenient when you’re out on the road? Have you gotten any feedback on your website? 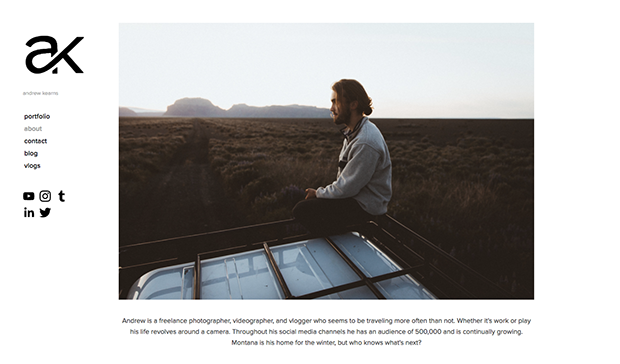 What’s been the most rewarding part of building your website with Squarespace? Ready to build your own portfolio website? 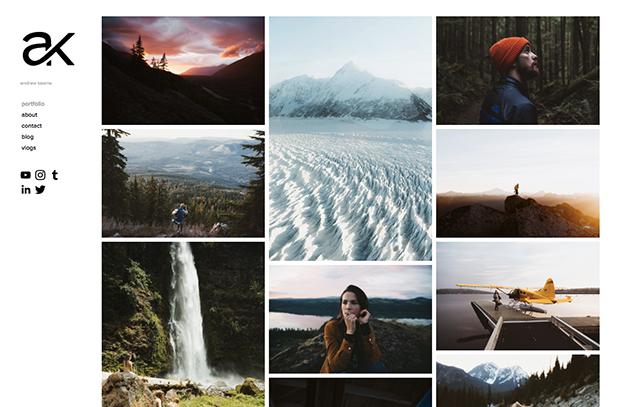 Try Squarespace free for 14-days! When you’re ready to subscribe be sure to use coupon ‘FEATURESHOOT’ for 10% off your first purchase.